London-based personal styling agency Perfect 10 has launched a new dedicated yacht service as part of its elite Black Label division. Previously the preserve of royalty and celebrities living in the British capital, Yacht by Black Label will now offer superyacht owners the chance to take a dedicated beauty, wellness or health therapist with them while cruising anywhere in the world. With a huge range of treatments on offer for both men and women, including massages, facials, waxing, manicures and wet shaves using bespoke beauty products, Black Label has worked out how to make the most of a superyacht’s space while delivering top quality spa services. A client could, for example, request a manicure and pedicure on the top deck before heading to their cabin for a pre-dinner blow dry followed by a relaxing massage on the private owner’s terrace before bed. 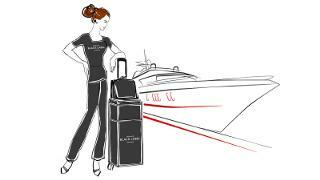 All Black Label therapists are on demand 24 hours a day while with their client and are well versed in the etiquette and discretion expectations of private yachts. Many have already visited clients on board yachts in locations as diverse as Monaco, Croatia, Fiji and the Caribbean while also making their services available on private jets, homes and holiday villas. Yacht by Black Label is ideal “for clients who wish to continue their facial regimes, fitness and nutrition schedules with bespoke programmes designed to suit any location, from a jet to a superyacht,” said Black Label founder Charlie McCorry, who started the business after working with Harrods ‘Urban Retreat Spa at Home’ service. The Yacht by Black Label service is available globally with prices starting at £600 per day, visit perfect10mobilebeauty.co.uk.